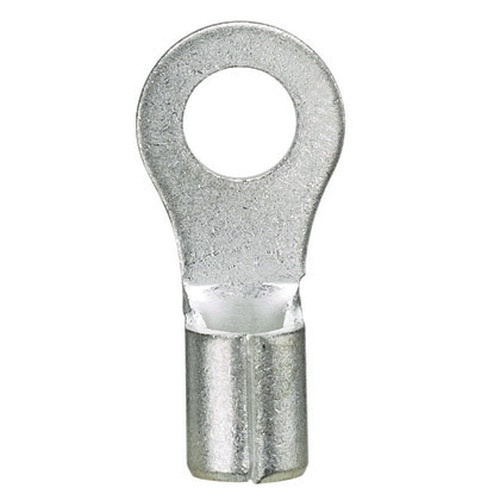 Panduit P-R Series Non-insulated ring terminal in metallic color, accommodates conductor of size 18 - 14-AWG. It features tin-plated copper construction for good conductivity and corrosion resistance. The 0.71-Inch long terminal with #10 stud, has 0.16-Inch Dia standard brazed seam barrel ensures a secure fit. Tang has a dimension of 0.31-Inch x 0.03-Inch. It has a wire strip length of 9/32-Inch. It withstands a voltage rating of 2000-Volts and temperature rating of 150 deg C. This terminal is suitable for use CT-100A, CT-200, CT-600-A, CT-1570 and CT-2500 tools. Terminal is UL listed, CSA certified and RoHS compliant.